Take dal in a bowl and wash it. Add fresh water to the dal and soak it for4 to 5 hours. In a mixer grinder grind the soaked dal adding salt and water. Add water little by little while grinding. Beat the batter with fingers to incorporate air for soft garelu (dumplings). The consistency of the batter should not be too thick or too thin. If the consistency of the batter is thick, the dumplings will not get cooked when fried. If the consistency of the batter is thin they absorb lot of oil when fried in oil. To test the consistency of the batter, take water in a bowl. Add a small portion of the batter in the water. If the batter sinks then the consistency is not right. If the batter floats then the consistency is right. The batter floats on water when it is light. So the fried garelu will be soft when the batter is light. First coarsely grind the green chilies, ginger and cumin seeds. Then add the curry leaves and grind (just use the whip button) coarsely so that the curry leaves will get chopped finely instead of becoming a paste. Take this ground mixture into a plate and keep it aside. Take curd in a bowl and whisk it with a whisker till smooth. Add salt to the smoothened curd and mix well. Heat a pan and add oil to it. When the oil is hot add the fenugreek seeds and black gram. Fry till the seeds start changing color. Then add the mustard seeds and cumin seeds. Fry till the seeds splutter and then add the asafoetida. Mix well and add the ground chili paste. Fry well and switch off the flame. Now add the turmeric powder and mix well. Turmeric powder when mixed with hot oil and mixed into the curd gives the curd a nice color. Now add the seasoning to the curd and mix well. Add chopped coriander leaves to the curd for better flavor. Keep this curd in fridge till use or else it will turn sour. We dip the garelu in either buttermilk and then allow them to soak to become soft. Then we add the soaked garelu to the prepared curd. The hot garelu when directly added to the curd curdles the curd and releases water. So to avoid this first we have to bring down the temperature of the garelu to normal and then soak them in the curd mixture to absorb the tastes of the curd. Mostly people dip the dumplings (garelu) in water after frying them. For better taste we are using buttermilk for soaking the garelu. When the garelu are dipped in buttermilk, they soak the buttermilk and become soft. Buttermilk is a product of curd so the flavors mix well. If we dip them in water and then add to the curd, the taste will be mild and different. Churn the curd, salt and water together and prepare thin consistency buttermilk. Salt in the buttermilk should be more when compared to the salt in the curd which we have prepared earlier. Heat a pan and add oil enough for deep frying the garelu. When the oil is hot, wet your fingers and take a portion of the batter with the wet fingers and drop small portions into the hot oil. After a while they float in the oil. Then fry them by stirring with a ladle till they are golden in color. Remove the garelu when they are light golden in color and immediately add them to the prepared buttermilk. Soak the garelu in buttermilk for few minutes. Do not fry the garelu till they turn red in color. Such deep fried garelu when dipped in buttermilk will not absorb any liquid. So it is necessary that the garelu are fried till they are light golden in color. After few minutes observe that the garelu have absorbed buttermilk and become soft. Remove them from the buttermilk and keep them in a plate separately. Like this fry the garelu with the remaining batter and soak them in the buttermilk and keep them separately in the plate. Take two bowls and add the soaked garelu in each bowl equally. Now add the prepared curd on the garelu and spread it. See that all garelu are nicely dipped in the curd mixture. Leave these bowls aside for one hour. After one hour observe that the garelu have absorbed the curd mixture. Now they are ready to be served. Serve garnished with chopped coriander. Why we fail in making this dish? If the batter is thick and garelu are made with this thick batter, then they will not get cooked and will not absorb any liquid. Batter should be light—so check for the consistency. If the batter is of right consistency but garelu fried till they turn red, then also the garelu will not absorb any liquid. So fry them till they are golden in color then they will absorb the liquid to become soft. If the proportion of salt is more in curd mixture than the proportion of salt in the buttermilk, to balance the salt it will draw water from the soaked garelu. Thus the garelu will become hard and your recipe fails. So take care and see to it that the salt is more in the buttermilk than the salt in the curd. See that the buttermilk tastes saltier than the curd mixture. 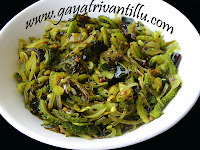 If one follows these points and make this recipe then you can enjoy soft and tasty Chitti Avadalu. in buttermilk and soak them in the curd mixture. To soak them we need a flat bowl to occupy all the garelu separately. Then while serving serve each avada with some curd on it. But here I made chitti garelu (fried small dumplings of the batter) and arranged them in two individual bowls. Each chitti avada can be eaten with a spoon. As a policy I answer to those who leave their name and the name of the recipe. Though I saw you question on the blog, I couldn't address it and therefore left it. At room temperature 55 ml of water is equal to 55 grams. You may add 50 grams of water initially and go on adding more if required. Remember how much water you strain from the Pappu etc. matter. Therefore be a bit careful and add water little by little while grinding. The batter should be fluffy and float on water as shown in the video. avadalu and kobbari mamidikaya pachadi try chesanu. simply super asalu. credit goes to you. i am very thankful to u. nenu garelu recipe kuda chusanu but meeru 30 ml of water use chesaru. if there is any variation plz clarify this. May I know the other name for 'soda uppu'? What is meant by ENO fruit salt? Is that the same. Will u plz let me know this. 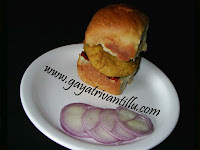 By the way soon post the items like Garelu, Perugu Aavadalu, in ur site. When I was new to cooking I had the same doubt. It took some time for the things to get clarified. In chemical composition they are different. Soda Uppu ( Soda Namak) is same as Baking Soda also known as Vanta (Khaneka)Soda. Its different from Baking Powder. After putting Soda Uppu (Soda Namak) the recipe should be put to heat immediately for raising, example Mirapakaya Bajjilu etc. In baking powder the recipie can be put to heat a bit leisurely and it slowly raises as the temperature rises example cakes, gulab jamun. because we are devotees of anjaneya and every now and then we have to make prasadam . Love the way u explain every detail abt every receipe, the best of all is ur language...accha telugulo entho baga describe chestharu. 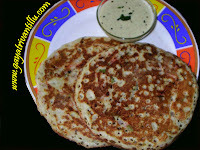 I have tried ur chitti avadalu.....they have come out so very well...i wud say all the credit goes to u. My hat off of for u and pls continue wat u r doing....its a massive success. Thanks Muchly for the yummy receipe.